How would you feel if a man walked into a business meeting wearing a skirt and 8-inch heels? 20 years ago that would have been absolutely unthinkable, but if one American designer has his way that may soon become the norm. When I saw photos on Facebook of Thom Browne’s latest line for men, I have to admit that I was floored. If you have not seen what I am talking about yet, you can do so here and here. Personally, I believe that men should dress like men and women should dress like women, but much of society is moving in the exact opposite direction. In recent years we have been hearing a lot about “gender fluidity”, and this is yet another example of that phenomenon. The distinctions between men and women are being blurred, and there are many that would like to eliminate them altogether. Gender fluidity in style is no longer a thing for only women, but men too. 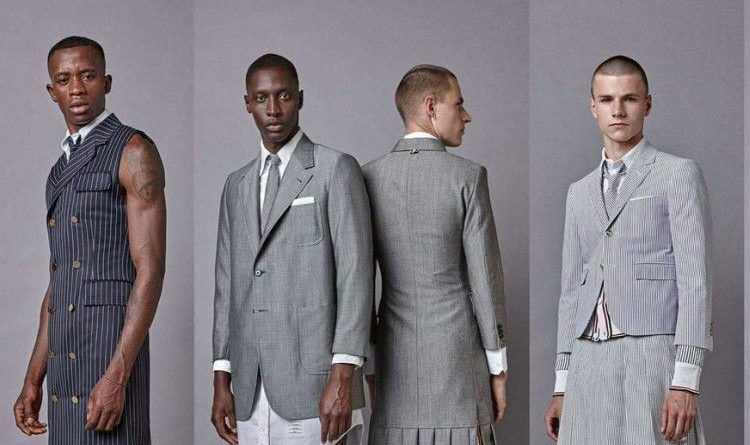 Thom Browne, an American designer seems to think men should embrace the trend too and rock a few pieces ‘borrowed from the girls’. His spring summer collection presented at the ongoing Men’s fashion week had a slew of dress shirts, tunics, maxi dresses and skirts all worn with pointy-toe heels. Who says what a man should and shouldn’t wear? The collection seems to drive a conversation many of us never want to have. And, if a woman can wear a pantsuit, why can’t a man wear a skirt suit? Probably, this is what the designer wanted to us to talk about. Doing whatever is right in our own eyes may make a lot of sense for Browne, but a society without gender would be complete chaos. God created both men and women for a reason, and trying to eradicate masculinity and femininity would be a tragic mistake. For too many years, men have suffered from a lack of options in the fashion realm. So, four Chicago-based business school buds sought to rectify this injustice by introducing to the world (for better or for worse) the male romper — er the RompHim. When I see men dressed in rompers, part of me wants to laugh, but another part of me wonders where all of this is heading. “I think I’m weird because that I feel very genderless; I feel ageless; I feel like I’m just a spirit soul, not even divided by human being, or I treat the animals the same or, hopefully, treat the planet with as much respect as possible,” Cyrus said during an interview on Lorraine, a U.K. morning show. “I feel very much like there’s no ‘us’ and ‘them’. There’s no ‘me’ and ‘you’. I feel like I’m kind of just — I want to be everything, and I want to be also kind of nothing. I just want to be able to be myself,” she continued. But tens of millions of young people around the globe absolutely adore Miley Cyrus and look up to her as a role model. So as Miley Cyrus embraces a “genderless identity”, it is inevitable that large numbers of other young people will follow in her footsteps. This is yet another example that shows that we need to be very careful about what we feed into our minds. The average American consumes approximately five hours of television “programming” a day, and it is inevitable that all of that “programming” is going to have a dramatic impact on how we all see the world. After thousands upon thousands of hours of “programming”, many of us may be ready to accept just about anything – and that includes men dressing in skirts and heels.